There are certain places in Europe that are known to be great for cycling. Amsterdam has been pro-bike for generations; in Copenhagen they say over three quarters of all journeys are made by bike; in Paris they developed the mass-bike-hire system and even London’s bouffant haired mayor, who cycles to work, is trying to improve that city’s reputation as the worst place to cycle in Europe. I can’t think of anywhere in Central and Eastern Europe that is bike friendly – the car still rules supreme in this part of the world – and bikes are seen as a form of transport for peasants or eccentrics. In Romania the standard advice is “don’t go by bike…the drivers here are mad”, and most people assume it is a terrible country to ride in. But I have found Romania to be superb countries to ride in. Not only is Bucharest a joy to cross when the traffic is gridlocked, but there is a network of small country roads that lead to the most fascinating and bizarre villages in Europe, and a population still living off the land (in my own country, UK, only 2% of the population live on the land; in Romania the figure is closer to 40%). The other advantage of cycling in Romania is that nobody really does it. It’s not “on the map” in the cycling world (although there is a growing population of mountain bikers who clog up the main parks in Bucharest). I’ve heard of dedicated cycle roads in the Czech Republic and Switzerland and people have come to believe that cycling on the road isn’t possible, or safe, without a separated bike lane (even though nobody had even heard of a bike lane for the first 100 years of bicycle history). I have found Romania to be one of the best places to go on long journeys by bike (cycle tours). As soon as you get off the main road you discover another world – village life – a world where you can still see people on the streets (unlike in UK where the villages all seem abandoned) and in each village there seems to be another drama taking place; a different cast of characters; different scenery and scores of running dogs. Some of the villages have been modernised (ruined) while others retain their ancient charm. There are over 3000 villages in Romania. It would take a lifetime to explore them all. Another major asset that Romania has regarding cycling is its sleeper trains. From Bucharest you can get the overnight train to all the distant cities like Cluj, Iasi and Timisoara (as well as all the main cities that are far from the capital) and if you book into a sleeper wagon you can get a good nights sleep on a real bed with proper cotton sheets. I call these wagons “The Time Machine” as they are a throwback to how trains used to be in the 1940s and even though they go at a snails pace they tend to leave Bucharest at a decently late hour and arrive early morning. If you work in Bucharest you can leave on Friday night, explore a remote corner of this fascinating country and be back in town on Monday morning. Or you can spend the weekend driving. 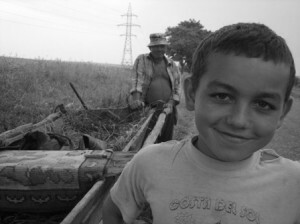 My journey took me to the remote county of Botosania, located in the far north east of Romania right on the border with the (former Soviet) Republic of Moldova. Botosani is not one of those places that one has to pass through in order to go somewhere, it is at the end of the line and stuck in a corner of Romania. Also, it is considered to be one of the poorest counties of Romania and therefore undesirable from the touristic point of view — but ideal for people like me who like to go to places that aren’t overrun with tourists. And then I stand around looking lost and confused (and foreign) until they let me on board. I have a Moulton Touring bike which splits in half and goes into two black bags so they look more like large pieces of luggage rather than a bike, and I’ve always managed to get it onto trains, planes and automobiles without having to resort to bribery or corruption. (Once I got it onto a sleeper to Montenegro that already had 5 people sleeping in the cabin). After a great nights sleep on real cotton sheets the grumpy fat butler (each wagon has one) woke me up and said “Leorda” — the tiny station I was heading to. It seemed like the whole population of Leorda, including half a dozen mutts, showed up for the train and there was pandemonium for a few minutes — followed by total silence. The villagers had come to meet their friends off the train, collect sacks of stuff and people getting off; load up the carts and took off. I was left with the weeds and the dogs while the village drunk looked on blearily. I reached the main road and headed for Dorohoi, the second biggest town in the area, a town that was once the Jewish capital of Romania (along with Botosani and Iasi), and is now in the news as it has been flooded by the Siret River. I went to the market for some fruit and cheese and was transported back in time, a time when people would banter across the market, shout jokes at each other, and be much more inquisitive and open than they are nowadays. The Moldavian peasants are witty, relaxed and prone to philosophising but they are becoming a rare species as market forces are making them irrelevant. I then cycled to the small town (or is it a big village?) of Saveni, where I was planning to find a guest house and spend the night. Getting there took most of the day as it was quite a trek across the county. I had thought that Botosani was a flat county and that cycling across it would be easy. I was wrong on both counts. It’s not flat but it’s not hilly either. It has a landscape that I haven’t seen anywhere else; rolling plains. The only way to describe it is to compare it with the sea. If you can visualise the shape of a wave — long, regular but with no peaks — then you should be able to imagine the land of Botosani, which comes in endless waves; hill followed by depression followed by hill. Although the land looked rather lush and green there didn’t seem to be anyone around, there were very few cars to bother me and it all seemed rather idyllic. Every village, however poor, has at least one shop. They all seem to contain the same products that are supplied by the multinationals but I was in no mood to contemplate the evils of globalism; all I wanted was something sticky, sweet and wet that would quench my thirst and give me energy. But each village shop has something that you don’t find in the city: people who are keen to come out and chat. All were interested in my bike, my route, my sanity and they were incredibly friendly. In one shop, in a village by a big lake, I saw that the shoppers would all go into the garage. I asked why and they showed me a stack of wooden boxes containing live fish. The shopkeeper said they’d been taken out of the lake that morning and can live without water for more than a day. At Saveni, the town I was intending to sleep in, I couldn’t believe that there was no guest house. This is supposedly the third biggest town in the county and there was nowhere for visitors to stay. I spend a few hours feeling sorry for myself and wishing I’d brought my camping gear and then remembered a friend who’d moved to Dubai whose parents came from this area. A few phone calls later got me the address and I was off to a nearby village where I was treated like a king. From then on to Botosani city was an endless slog, but a rewarding one. The glow of satisfaction one gets at the end of a long ride is incredible. I went through the gypsy town of Stefanesti and another big village where a riot seemed to be taking place (I stopped for a gawp and found it was just a bunch of drunken peasants shouting at each other across the road), and endless field and forest. I started off sweating like a pig but ended up cold as hell. By the time I approached the big prison on the outskirts of Botosani it was raining cats and dogs but fortunately I had good waterproofs and managed to stay dry. That night I was on the sleeper train back to Bucharest. Great article! I completely agree, Romania is a wonderful place for bike trips and I always have a story to tell after cycling through a village. The best trip I’ve done recently was Bucharest to Ruse in Bulgaria: 100 kilometres of country roads, dirt tracks and villages. As to London, which you mention, I used to cycle there a lot as a student and can remember some fairly hairy moments. I was cycling there again recently, however, and everything seemed so much better. Most of all I was impressed by the “bike zones” at traffic lights (areas in front of the cars at traffic lights reserved only for bikes and that allow you to be the first to pull away when it turns green). Too right, lovely biking country. I cycled 1500kms in a big loop from Oradea via Apuseni, Cluj, Maramures, Suceava, Bicaz to Brasov back in 1997, still have warm memories. Try Shkodra, Albania. First town in Albania (the Balkans?) with bike lanes and a workforce that uses bikes in numbers. It helps that the town is quite flat, unlike the rest of the country. Indeed cycling in the best way to not only see Romania, but to meet the local people as well. If one takes the train to Iasi from Bucharest or any other starting point on arrival in Romania one arrives in the Historic city and can spend a day expoloring the City with its park and botanical center in Copou, Palace of culture and many historic Churches and learn from locals about the famous poet Mihai Eminescu. After this once can take a real ride into the past and re live in a time seemingly gone by. To explore this delight and a Country filled with nature and villages that have stood by in time you take the road from Iasi to Popricani, Cirniceni, Probota, Trifesti, Bivolari, Tabara and in each village you will be assured of a warm welcome by locals so it is well worth taking your time on your cycling journey. The roads are not busy and in fact most are used by horses and carts and with few cars even nowadays. You can then after Tabara village within a few kilometers pass over into the County of Botosani and as desribed in Ruperts fine article will also find peace and tranquility, plus a warm welcome as you explore the County and meet local people. In such a journey you will be assured of clean air well away from the City fumes and masses of cars, plus will in both Counties on your travels without a doubt be invited to taste traditional local food. Its a wonderful Country within the north east of Romania and there are so many places and sights to explore. In short the rural areas leading from Iasi to Botosani are well woth the trip and well worth exploring. Your article reminded me of the way I used to rent a bike in Thailand, Vietnam, Laos or China. Having arrived in a remote small town after an 8 hour pick-up truck ride, the best way to explore around was to rent a bike and ride across the paddy fields for hours. During those hours you tend to discover the most amazing places and people and that’s where the longest lasting impressions take root. I can only pick up one of those moments in a village off of Hue where the air smelled of cinnamon. On the main road we passed by a little house. On the porch sat a little girl rolling incense sticks. As we rode past her house she picked a flower and gave it to me smiling. That, above all, is Vietnam to me. It also made me think of how many times I promised myself (while abroad) that upon coming back home I would start taking accelerat trains to no-matter-where and get to know my own country better before I start judging its “disadvantages”… I hardly ever got to do it properly though. I loved the article, the photos and Jelly Roll Morton´s music. Took me back to those times long ago when I went to Botosani with MSF. This post makes me remember about my last trip in Eastern Europe. Romania Active made my trip wonderful for my friends and me. We enjoyed our bike-tour which was specialy built for us. Even if it can be a bit more expensive than a solo tour, i think it`s better not waste time on a organization. All was booked before arrival and that`s very useful! We had more time and no stress to admire Transylvania and Carpathians landscapes!! The travel agency`s team is english and french-speaker and that`s very good! Readable and an eye opener to Roumania. I’m also reminded of my cycling youth, e.g. touring round Wales. I wish trains here are more like those in Roumania with more sleepers and more dining cars (only East Coast and the expensive luxury trains seem to have them now).